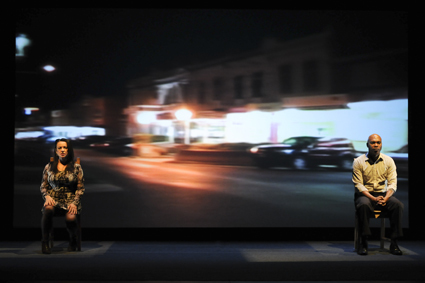 VERSION 1.0 HAS BEEN CREATING AMBITIOUS PERFORMANCE WORKS IN AUSTRALIA SINCE THE 1990S. THEIR LATEST, THE DISAPPEARANCES PROJECT, UNFURLS SLOWLY AND CAREFULLY AS IT INTERROGATES THE LOSS THAT REVERBERATES ACROSS SPACE AND TIME WHEN SOMEONE YOU LOVE DISAPPEARS. PERFORMERS IRVING GREGORY AND YANA TAYLOR TAKE THE AUDIENCE WITH THEM INTO THE TENSE AND SOMETIMES SHATTERING STATE OF MOURNING FOR THOSE WHO REMAIN UNCERTAINLY LOST. In the company’s characteristic verbatim style, the performance includes excerpts from interviews conducted by version 1.0 with people who had experienced the loss of a loved one through disappearance. The performers share excerpts from stories they gleaned from these interviews, telling them as if they were their own. The authenticity of these narrative fragments in The Disappearances Project is both fascinating and painful to witness. The first light of Yana Taylor and Sean Bacon’s video projection flickers across a large screen to Paul Prestipino’s emerging soundscape, laden with falling raindrops and trembling cascades of sound. The video, shot through the window of an endlessly, slow-moving vehicle, creates the sense of an exhaustive and inexorable search. Streetlights leak into a dawning cityscape to the incessant sound of dripping water. Rural and suburban streetscapes flitter onto the screen—their familiarity directly implicating viewers in the stories they will hear. Yana Taylor and Irving Gregory’s miked voices emerge, disembodied—as if suspended in space—until their bodies are gradually illuminated by side lighting. For most of The Disappearances Project, the performers remain seated—upright, alert and tense on wooden chairs either side of the stage. Their near frozen stillness and the nervy soundscape charge the space with a sense of impending danger, tracing a plateau of quiet intensity which creeps to its peak when Taylor’s numbness begins to crack towards the end of the piece. The heaviness of the stories they tell visibly wears away at her, while Gregory maintains a veneer of relative calm. Taylor and Gregory do not perform fixed characters, but multiple embodiments from a range of experiences of loss. These float across the surfaces of the skin and the resonant timbres of their voices, a performative choice that neatly destabilises the potential for a linear performance structure and without leaning into didacticism. Sustained, disciplined stillness allows for this, as does the weaving of multiple stories into the performative fabric, without the performers embodying any singular identity. Perhaps Taylor and Irving explore a type of traumatised dis-embodiment, where they are rendered motionless due to the incomprehensible size and weight of such loss—a loss that always remains open, without closure. The terrifying ambiguity of not-knowing displaces the missing persons’ loved ones. This nightmarish loss is always repeating itself in The Disappearances Project by perpetually asking, ‘What if?’ Taylor and Gregory articulate the varying registers of hope, denial, despair and anger that fill this non-place, for the most part with sensitivity and command. The audience is encouraged to maintain a critical distance for the majority of the performance. At certain points, I wanted to be invited to ‘feel-with’ these stories of loss, rather than hover over them. This is the challenge of verbatim theatre that version 1.0 repeatedly faces with gusto: how can performance move an audience affectively, whilst also moving them to think critically about important social issues? The company managed this particularly well in The Bougainville Photoplay Project (2009-11). Despite the successes of The Disappearances Project, I'm uncertain as to whether it met that challenge this time. What The Disappearances Project highlights is a bureaucratic system predicated upon bodies that are fixed, stable and identifiable. The disappeared haunt the loved ones left behind who are punished further by bureaucracy’s inability to cope with the intricacies of human feeling. Where do loved ones of those who have disappeared go for help? Can our system accommodate and support complex human experiences? Whether or not verbatim theatre is an adequate mode for responding to such questions, at the heart of The Disappearances Project is an important plea to rethink the inadequacies of apparent democracy that fails when we need it most.